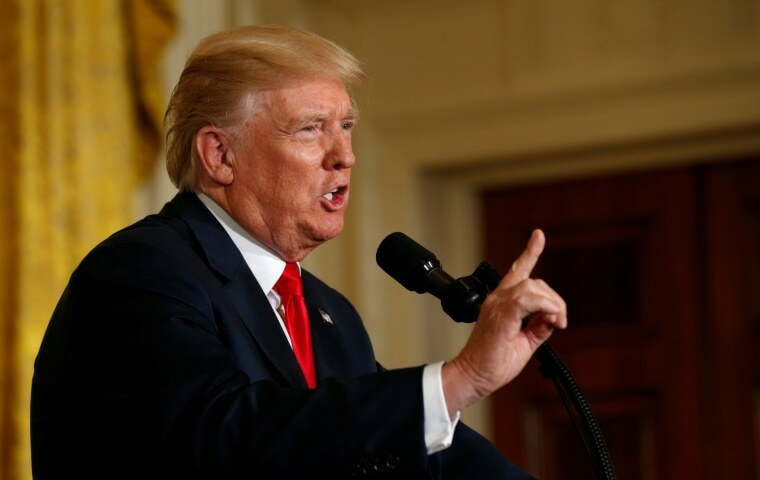 President Donald Trump warned North Korea on Tuesday that "all options are on the table" just hours after the rogue regime launched a missile into Japanese airspace. "The world has received North Korea’s latest message loud and clear: this regime has signaled its contempt for its neighbors, for all members of the United Nations, and for minimum standard of acceptable international behavior," Trump said in a statement. "Threatening and destabilizing actions only increase the North Korean regime’s isolation in the region and among all nations of the world," the president added. "All options are on the table." When asked about the escalating situation with Pyongyang as he left the White House to depart for a trip to Texas, Trump said that "we'll see" what happens with North Korea. Nikki Haley, the U.S. ambassador to the United Nations, echoed Trump's tone, saying that "enough is enough" when it comes it comes to the regime's latest action. Secretary of State Rex Tillerson told reporters Tuesday, "we’ll have more to say about that later." Trump's warning came less than 24 hours after Kim Jong Un's regime fired over Japan what South Korean military officials were calling an "unidentified ballistic missile." The Department of Defense on Tuesday identified the missile as an intermediate range ballistic missile (IRBM) and said that it "did not pose a threat" to North America or Guam. The Associated Press reported that the South Korean military was analyzing whether it was the Hwasong-12, a new intermediate-range missile that Pyongyang recently threatened to fire into waters near Guam, which hosts a major U.S. military base. Following the launch, Trump and Japan Prime Minister Shinzo Abe spoke on the phone for 40 minutes, the White House said. According a to a readout of the call provided by the White House Tuesday, Trump and Abe "agreed that North Korea poses a grave and growing direct threat to the United States, Japan, and the Republic of Korea, as well as to countries around the world." "President Trump and Prime Minister Abe committed to increasing pressure on North Korea, and doing their utmost to convince the international community to do the same," the White House said. Washington and Seoul are currently conducting war games in South Korea and its territorial waters; North Korea typically reacts with anger to such military drills. In recent weeks, North Korea has launched a series of missiles toward Japan, with most falling into the Sea of Japan to the west of the country. Trump's stark threat Tuesday wasn't his first aimed at the regime, however. Earlier this month, after reports emerged that North Korea had developed a nuclear weapon small enough to fit on a missile, he promised "fire and fury like the world has never seen" if the country continued to threaten the United States. A day later, he said his statement "if anything ... wasn’t tough enough."